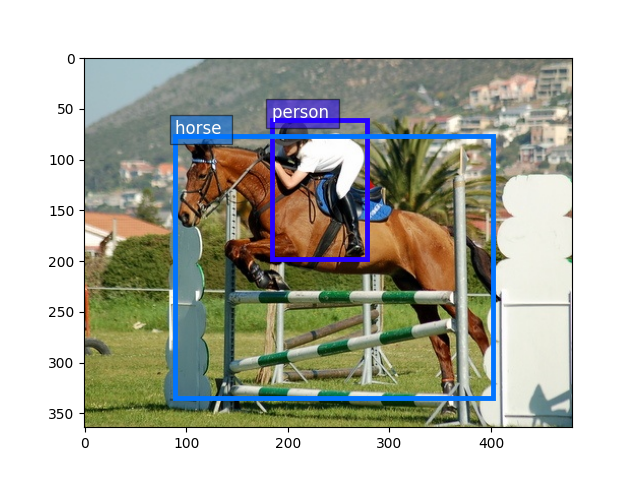 Pascal VOC is a collection of datasets for object detection. The most commonly combination for benchmarking is using 2007 trainval and 2012 trainval for training and 2007 test for validation. This tutorial will walk through the steps of preparing this dataset for GluonCV. You need 8.4 GB disk space to download and extract this dataset. SSD is preferred over HDD because of its better performance. The total time to prepare the dataset depends on your Internet speed and disk performance. For example, it often takes 10 min on AWS EC2 with EBS. which will automatically download and extract the data into ~/.mxnet/datasets/voc. Loading images and labels is straight-forward with gluoncv.data.VOCDetection.